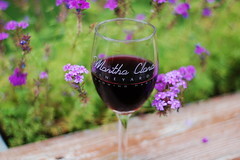 Wineries are in abundance on the North Fork of Long Island and today I would like to share some activities at the Martha Clara Vineyards. The Entenmanns family bought the land in the late 1970’s and converted it into the Martha Clara Vineyards in 1996. The first grapes were planted and now they have over a dozen types of Classic European varieties including Chardonnay, Viognier, Sauvignon Blanc, Merlot, Cabernet Franc, and Syrah. The Martha Clara Vineyards’ tasting room is open throughout the year and their gift baskets are perfect for the Holidays. They can ship to Connecticut, California, New York, and Colorado and if you are looking for a gift for a wine lover, put this on your list. Or, why not give the gift of joining their Wine Club? Friday, December 11th – Wine Club Exclusive Wine Release Party at 7 P.M. New releases will be featured and they will have discussions about the harvest. Also, they will provide a tasting for a few of their 2009 futures. Free to Wine Club Members. A Night of Seven Fishes, Menu and Wine Pairing Dinner Friday, December 18th from 7 to 9 P.M. Featured Chef will be David Girard of Buoy Seafood Market & Restaurant and tickets are $40 per person. Tom Schaudel Wine Dinner, Saturday, December 19th from 7 to 10 P.M. Menu features Seared Diver Scallops; Catapano Farm’s Goat Cheese Ravioli; Porcini Dusted Yellow Fin Tuna, Slow Braised Short Ribs, and Killer Fudge Brownie Sundae. Tickets are $70.00 per person and includes wine paring.